Candidates should possess DM/ M.Ch/ DNB in Super Specialty in the Specialty concerned for Medical Oncology/ DM (Oncology)/ M.D (Medicine) or MD (Radiotherapy) or M.D (Pediatrics) for Sl No A (01 to 03), MBBS from any Institution/ University recognised by the MCI and MD in Medicine for Medical Super specialty branches and must be registered under the State/ Central Medical Registration Act for Sl No A (04) with relevant experience. For more qualification details refer the notification. Candidates should have minimum age limit of 25 years and maximum age limit of 50 years for Associate/ Assistant Professor, Senior resident and other posts. For Professor posts maximum age limit is 62 years. For Professor Post : Candidate will be paid Level –19 Pay Band-IV (10,000/- Grade Pay + NPA as admissible). For Associate Professor Post : Candidate will be paid Level –11 Pay Band-IV (8700/- Grade Pay + NPA as admissible). For Assistant Professor Post : Candidate will be paid Level –11 Pay Band-III (6600/- Grade Pay + NPA as admissible). For Senior Resident Post : Candidate will be paid pay scale Rs. 18,600/- to Rs. 20,100/- + Grade Pay Rs. 6600/-. For all other candidates is Rs. 500/- in favour of Director of BPS Govt Medical College for woman. 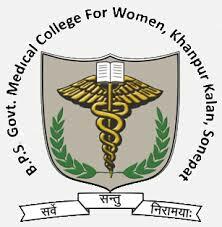 Faculty, Demonstrators/ Tutors, Sr. Resident for the post of BPS Medical College applications invite in prescribed format with required copies of certificates send to “The Office of Director, BPS GMC for women Khanpur Kalan, Sonepat".